We specialize in designing and producing custom MatrixArrays that allow simultaneous force measurements across a grid of cells. They are used for capturing static and dynamic footprints, multi-touch user inputs, and truly expressive musical controllers. Use an XYZ Pad if only single input (i.e. stylus) force+position is needed. For applications requiring lower resolution & easier hookup, discrete matrix arrays are recommended. Off the shelf prototypes are available for your evaluation. 4" x 4" Active area ShuntMode matrix. 256 sensing locations with wide dynamic range. 2" x 3" Active area ThruMode matrix. 160 sensing locations, capable of low force detection. 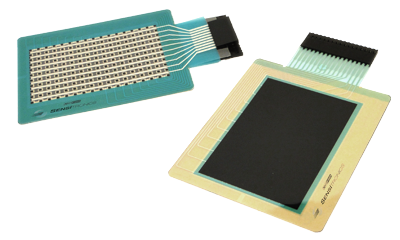 Custom sensors on both rigid and flex PCBs.